SaltStack orchestration integrated with ServiceNow delivers a modern cloud management platform with built in configuration automation. “The SaltStack integration with ServiceNow bridges an all-too-common gap in business between people and the technology they need to get work done and sustain competitive advantage. This gap often results in shadow IT." SaltStack, the creators of orchestration software for event-driven cloud infrastructure, today announced it has received certification of its integration with ServiceNow. Certification by ServiceNow signifies that SaltStack Enterprise cloud and data center orchestration software has successfully completed a set of defined tests focused on integration interoperability, security and performance. The certification also ensures best practices are utilized in the design and implementation of SaltStack Enterprise integration with ServiceNow. Enterprise IT operations management teams use SaltStack software integrated with ServiceNow to deliver Web-scale IT through the efficient deployment, provisioning and ongoing management of multi-cloud infrastructures and requested business services and applications. Combine the best of ITIL and DevOps methodologies. Marc Chenn, SaltStack CEO, said, “The SaltStack integration with ServiceNow bridges an all-too-common gap in business between people and the technology they need to get work done and sustain competitive advantage. This gap often results in shadow IT. With cloud and data center infrastructure in high demand, IT teams are on the hook to simultaneously make cloud resources easily accessible and consumable while ensuring responsible consumption and oversight. SaltStack provides full command and control of IT infrastructure. With the SaltStack integration to ServiceNow, customers can utilize the ServiceNow UI to tap the power of SaltStack IT operations automation for robust data center and cloud orchestration and configuration automation. This integration wraps ServiceNow governance and workflows around SaltStack event-driven infrastructure automation, marrying best-of-breed automation for people, process and technology. SaltStack Enterprise exponentially expands the cloud orchestration and data center automation possibilities available to ServiceNow customers. SaltStack can be used to deploy, manage and configure essentially any cloud, operating system, virtualization, application or code. Common uses cases for the SaltStack Enterprise integration with ServiceNow include closed-loop change and configuration management to help achieve a proper balance between IT operations speed and agility, and the need for risk management. ServiceNow process automation is utilized for change management workflow, review and approval, and SaltStack for automation of change execution and compliance at the infrastructure level. Customers can also use SaltStack Enterprise with ServiceNow for end-to-end service request fulfillment. ServiceNow is utilized for its self-service and service catalog portals and SaltStack is used to provision and maintain requested software (code, applications, application containers, operating systems, etc.) and infrastructure (virtual machines, servers and hardware in public cloud or private infrastructure). SaltStack is proud to be a sponsor of Knowledge15, the ServiceNow user conference. Find SaltStack in Las Vegas, April 19-24, to learn more about the next-generation of IT systems and service management. 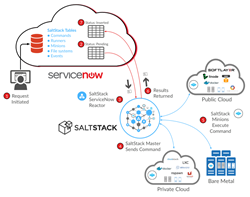 The SaltStack integration with ServiceNow is now available to SaltStack Enterprise customers. Visit the SaltStack orchestration for ServiceNow webpage to learn more about the integration.